Scenic Luxury Cruises & Tours has announced that the first sailing date for Scenic Eclipse, the World’s First Discovery Yacht™, is being amended to 15 August 2019. “We are deeply sorry for the inconvenience these delays to the launch of Scenic Eclipse have caused our guests. As a company, we have done everything possible to complete the ship within the time limits that were set previously, but a series of events that are outside our control have put us in a position where we must delay,” stated a company spokesperson. As reported in the media the ongoing financial challenges faced by the Uljanik Shipyard, where the Scenic Eclipse is being built, have caused a range of ongoing impacts. Shipyard workers have not been paid full salaries since August 2018, which has led to strikes and manpower shortages as well as several other shipyard disruptions, resulting in months of lost production. 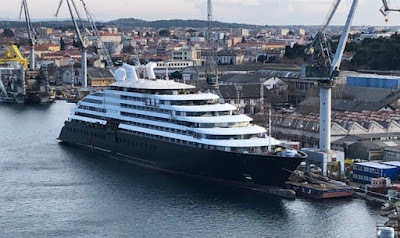 To keep the Scenic Eclipse build moving as quickly as possible in these challenging circumstances the company expanded their team within the shipyard by employing Cruise Ship specialists from Finland, Italy, the UK and Norway. The expanded Scenic team took over the lead role in completing the ship with in excess of 115 directly-employed specialists in cooperation with the shipyard’s remaining management team and more than 500 subcontractors. Accordingly, the Scenic Group has signed a letter of intent with the new consortium that will lead the shipyard to set up a new Discovery Yacht division within the restructured Uljanik group. This new joint venture will be fully focused on completing Scenic Eclipse and on expediting the build of Scenic Eclipse II, as well as progressing development of the next generations of Scenic’s Discovery Yachts. As Scenic’s guests will experience, the overall quality and sophistication of the vessels is second to none. The challenge has been the constant interruptions to the build process, late deliveries of equipment and other crucial supplies that have made it extremely difficult to keep any normal shipbuilding schedule, causing the launch to be pushed back. Scenic Eclipse sets a whole new benchmark in design, innovation and luxury. With its commitment to world-class safety, innovation in design and quality appointments throughout, offering guests the experience of discovering the world in all-inclusive luxury remains Scenic’s primary focus.